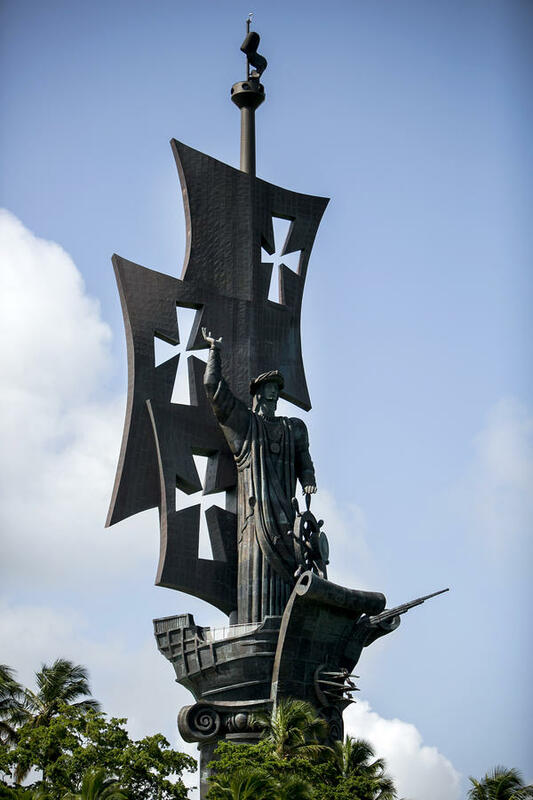 The Birth of the New World statue photographed in August depicts the image of Christopher Columbus standing over Arecibo. Over the years, Puerto Rico has wooed visitors and investors with beaches, sun, tax breaks and splashy public works. Puerto Ricans say it's taller than the Statue of Liberty and the largest homage to Christopher Columbus in the world. It's a towering 350-foot-tall statue of the explorer and it's perched on the island's waterfront. While the statue survived Hurricane Maria which hit Puerto Rico more than two weeks ago, the town it resides in wasn't as lucky. It's tough to do justice to the huge sculpture that towers over Arecibo, a beach town on Puerto Rico's northern coast some 50 miles from the capital San Juan. The statue sits on a huge base, which is shaped like a ship, and is perched on a grassy hill. A thin-faced Christopher Columbus stands on top. His open right hand juts in the air, his left steadies a huge steering wheel. This wasn't a very developed part of the northern coast to begin with but since Hurricane Maria hit, there's even less left standing. Just a few restaurants and some battered houses, such as Juan Mena's home, which is right next door to the statue. "When they inaugurated the 600-ton statue last year we all said, 'Wow.' We've never seen anything this big around here," Mena said. Mena got to ride the elevator up to the ship's observation deck, where he says he could see all the way down the coast. Plans were to develop the area, with hotels, a golf course, even a few zip lines. Maria however blew a huge hole in those plans. At the gas station down the road, a crew is cleaning up. The front panels of all the pumps are blown off, the station's roof is on its side and twisted metal liters the ground. Angel Carrion, who is shoveling piles of mud, says he isn't a fan of Columbus. "He colonized us, so from that point of view I don't like him but that's part of who we are," he says. Carrion is more accepting of the statue — especially since it was bringing in tourists. But Puerto Rico's indigenous people, the Tainos, bitterly objected — citing Columbus's infamous treatment of Indians in Puerto Rico and throughout the Americas. The sculpture's modern day journey to Arecibo was controversial too. Its Russian creator originally offered it to several U.S. cities but all declined. Puerto Rico accepted but kept the huge bronze pieces in storage, and bouncing between towns for more than a decade. Ricardo Dominich, an army veteran, says he's thrilled the statue finally landed in Arecibo. He just hopes his town sees better times soon. They still don't have water, electricity or cell service. "Right now we are in survival mode and you know making do and trying to be with the best of spirits that we have," Dominich says. At least, he says, there's beer in the stores, and he plans to spend Columbus Day drinking a few at the beach with the town's huge statue towering over them. Puerto Ricans say it is taller than the Statue of Liberty. This is the tallest statue of Christopher Columbus in the world we're talking about. It's a towering, 350-foot tall bronze statue of the explorer, and it is perched on the island's waterfront. Now, while this statue survived Hurricane Maria, which hit Puerto Rico more than two weeks ago, the town it resides in was not as lucky. Here's NPR's Carrie Kahn. CARRIE KAHN, BYLINE: It's tough to do justice to the huge sculpture. Luckily, I didn't travel alone to Arecibo, a beach town some 50 miles from the capital on Puerto Rico's northern coast. This is NPR producer Liz Baker. You're going to have to help me describe this. That is one tall statue. LIZ BAKER, BYLINE: It's tall. And compared to everything else around here, it really towers. KAHN: The 350-foot tall statue sits on a huge base shaped like a ship. It's perched on a grassy hill. A thin-faced Christopher Columbus stands on top. His open right hand jets in the air. His left steadies a huge steering wheel. BAKER: Three big sails with crosses cut out of them so you can see the sky through it. I assume there's one for each of his ships, the Nina, the Pinta and Santa Maria. All right. My kindergarten teacher would be proud. (Laughter). KAHN: This wasn't a very developed part of the northern coast to begin with, but since Hurricane Maria hit, there's even less left standing, just a few restaurants and some battered homes, like Juan Mena's, right next-door to the statue. JUAN MENA: (Speaking foreign language). KAHN: "When they inaugurated the 600-ton statue last year, we all said, wow. We've never seen anything this big around here," he says. He got to ride the elevator up to the ship's observation deck, where he says he could see all the way down the coast. Plans were to develop the area with hotels, a golf course, even a few zip lines. Maria, however, blew a huge hole in those plans. KAHN: At the gas station down the road, a crew is cleaning up. The front panels of all the pumps are blown off. The station's roof is on its side, and twisted metal litters the ground. Angel Carrion shovels up piles of mud. He says he isn't a fan of Columbus. ANGEL CARRION: He colonized us. So from that point of view, I don't like him. But that's part of who we are. KAHN: Carrion is more accepting of the statue, especially since it was bringing in tourists. But Puerto Rico's indigenous people, the Tainos, bitterly objected, citing Columbus's infamous treatment of Indians here and throughout the Americas. The sculpture's modern-day journey to Arecibo was controversial, too. Its Russian creator originally offered it to several U.S. cities. All of them declined. Puerto Rico accepted but kept the huge pieces in storage for more than a decade. Ricardo Dominich, an Army veteran, says he's thrilled the statue finally landed in Arecibo. He just hopes his town sees better times soon. They still don't have water, electricity or cell service. RICARDO DOMINICH: Right now is - we're on survival mode. And, you know, making do and trying to be, you know, as best of spirits with what we have. KAHN: At least, he says, there's beer in the stores. And he plans to spend Columbus Day drinking a few at the beach with the town's huge statue towering over them. Carrie Kahn, NPR News, Arecibo, Puerto Rico. Transcript provided by NPR, Copyright NPR.